Despite protests, Turkey's president Abdullah Gul signs law that tightens controls over web use. Turkey's president, Abdullah Gul, said Tuesday he had signed into force a controversial law voted in by the government that would tighten controls over web use, AFP reported. Gul said on his Twitter feed he promulgated the law - which the opposition and rights groups say infringes on citizens' freedoms - after the government assured him it would soften parts of it through later amendments. "I am aware of the problems mainly on two points.... These concerns will be taken into account in the new law," he said, according to AFP. 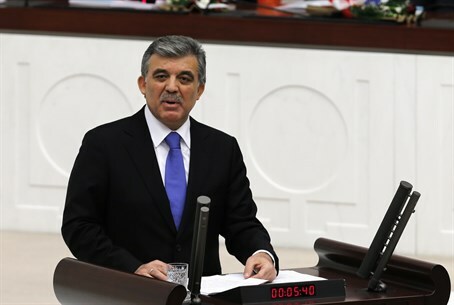 An opposition lawmaker earlier confirmed the planned amendments to aspects of the bill concerning some powers of Turkey's telecommunications authority. "The steps are positive but not enough," Akif Hamzacebi of the Republican People's Party (CHP) was quoted as saying by NTV television. Under the bill, the Telecommunications Communications Presidency (TIB) can demand that Internet providers block pages deemed insulting or considered an invasion of privacy. The government is now proposing that the TIB will have to inform a judge about any decision to block a web page, according to the Hurriyet newspaper. The judge would then have to issue a ruling within 48 hours or the TIB move would be deemed invalid. The Internet bill has sparked outrage both at home and abroad and fuelled concerns over the state of democracy in the EU-hopeful country under Prime Minister Recep Tayyip Erdogan. Last week, riots broke out in Istanbul's Taksim Square over the new censorship laws. The legislation came on top of moves to curb the judiciary and a government purge of police and prosecutors in the face of a corruption probe that has targeted close Erdogan allies. Erdogan has vehemently denied accusations of online censorship, and said Tuesday the proposed Internet curbs were aimed at countering "blackmail" and "threats". "The Internet will not be censored, freedoms will not limited," Erdogan told his lawmakers from his ruling Justice and Development Party (AKP) in parliament, according to AFP. He said the number of Internet subscribers in predominantly Muslim Turkey had swelled to 34 million from 20,000 since the AKP came to power in 2002. Erdogan’s secularist opponents have long accused him and his party of gradually imposing an Islamic agenda on Turkey. In 2012, a Turkish court formally charged an internationally known pianist and composer with insulting Islamic religious values, in comments he made on Twitter. Previously, Turkey's Nobel laureate Orhan Pamuk was prosecuted for his comments about the mass killings of Armenians, under a law that made it a crime to insult the Turkish identity. The government eased that law in an amendment in 2008. Last year, the Turkish parliament adopted a bill tightening restrictions on the sale and advertising of alcoholic beverages, despite strong objections by the opposition on the grounds of personal freedom and respect for lifestyle choices.